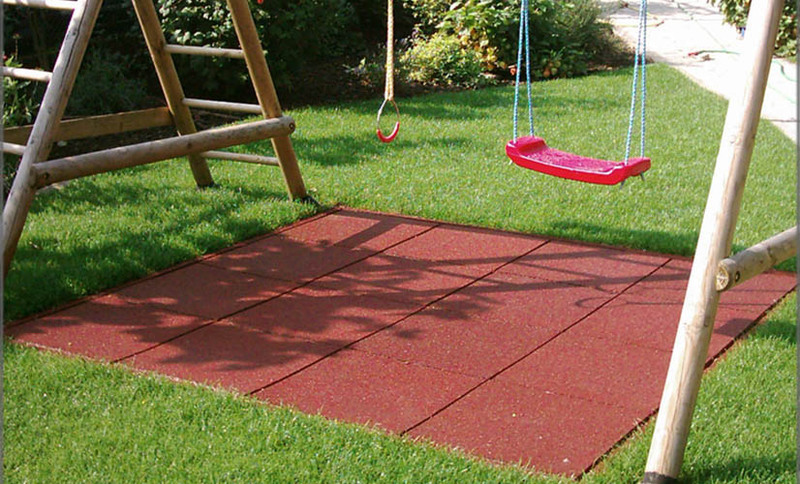 Supragom is a range of recycled rubber tiles used in playgrounds. This rubber flooring has a very high impact resistance. It can also be used in gyms in weight areas. It is a product 100% made in Europe. So it fulfils the strictest criteria in the production processes and raw material elections. It is made in 2 thicknesses 20mm and 40mm, and the tile comes in the 50x50cm size. We offer 3 basic colours (black, green, red) but we can make other colours. Supragom 20 and Supragom 40 protection floors are tested and comply in accordance with the standard EN 1177 (Critical Fall Height for Children Safety). Supragom can also be used as gym floors in weight rooms. Supragom 20 is available in 3 colors: black, terracota red and green. Supragom 40 is available in 3 colors: black, terracota red and green. Perimeter tiles can be bevelled. Over concrete or mortar floors previously installed. Use MDI based polyurethane glue for assembly, at a rate of 1kg each 4/5 sqm approximately. Apply a thin thread of glue on the floor and on the four sides of the tiles to join them together. With this method we avoid space between them due to expansion and contraction. You can also use PVC pin connectors.